Magazine Street in New Orleans has always been recognized as an economic engine in a historic part of the city popular with tourists. After hurricanes damaged the roadway, particularly from U.S. 90B (Calliope Street) to Nashville Avenue, the Louisiana Department of Transportation and Development began an aggressive repair schedule. The $6.7 million project finished under budget and was completed more than a month ahead of the November 2011 scheduled completion date. 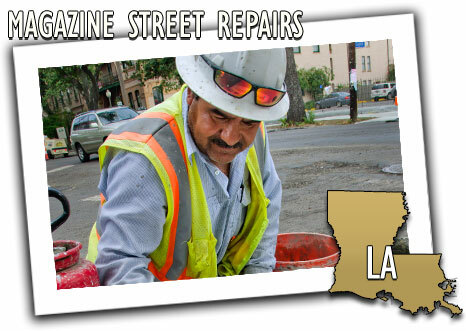 The Magazine Street repairs were part of the South Louisiana Submerged Roads Program, which repaired and resurfaced roads that were damaged as a result of hurricanes Katrina and Rita. Work included patching, resurfacing, repairing curbs, and installing new handicap ramps. Some stormwater drain pipes were repaired as well.